Gonoshashthya founder and one of the sponsors of the Jatiya Oikya Front Dr Zafrullah Chowdhury has called for a dialogue with Prime Minister Sheikh Hasina over bail for BNP Chairperson Khaleda Zia. His call came on Saturday (Feb 9) while addressing a human chain demonstration in front of the National Press Club during demanding the release of the incarcerated BNP chief. 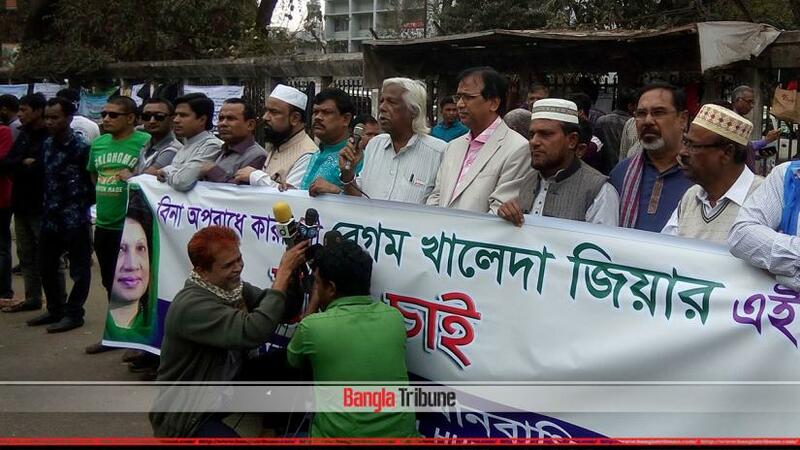 “Call another dialogue and state clearly that you won’t hinder Khaleda Zia’s bail,” Zafrullah said, addressing the PM. “I have consistently told the BNP leaders that they have to take to the streets,” he said, adding that 200 female BNP leaders taking to the streets, demanding democracy and Khaleda’s release would have been more impactful. The Gonoshsthya founder said that good governance in the country can only be restored through these protests. Describing acting chief BNP Tarique Rahman as the “future prime minister”, Zafrullah said that he must be patient as many are looking up to him. “You (Tarique) will definitely hold meetings with the party but with the senior leaders. Anyone can make a mistake,” he said. The Oikya Front steering committee member then said that Tarique, who has been given life sentence in the Aug 21 grenade attack case and is a fugitive, must take the “right decisions to wage a movement and free Khaleda”.